Q1. 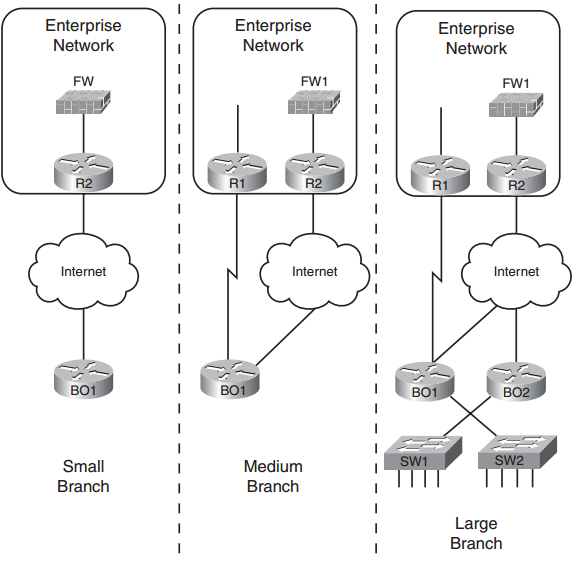 Router R1 sits at an Enterprise branch office, using the Internet for its only connectivity back to the rest of the Enterprise. Which of the following is not a benefit of using an IPsec tunnel for packets sent through the Internet, between R1 and the rest of the Enterprise? Answer: C. IPsec tunnels make for more secure communications, including encryption and authentication. However, it does not support IGP communications across the tunnel. Answer: A and C. An IPsec tunnel would be useful to allow the packet to pass over the Internet and into the Enterprise. The GRE tunnel would only be needed if an IGP is also needed, and for this design, an IGP is not required. Instead, a floating static default route would work fine, with the static route sending traffic over the IPsec tunnel but only when the private leased line fails. Q3. Router R1, a branch router, connects to the Internet using DSL. The engineer plans to use a configuration with a dialer interface. The answers list a feature and interface on which the feature could be configured. Which combinations accurately describe the interface under which a feature will be configured? Answer: D. The ATM details, like VPI/VCI, will be configured under the ATM interface. PPP (including CHAP) and Layer 3 details will be configured under the dialer interface. Q4. Router R1, a branch router, connects to the Internet using DSL. Some traffic flows through a GRE and IPsec tunnel, over the DSL connection, and into the core of an Enterprise network. The branch also allows local hosts to communicate directly with public sites in the Internet over this same DSL connection. Which of the following answers defines how the branch NAT config avoids performing NAT for the Enterprisedirected traffic but does perform NAT for the Internet-directed traffic? Answer: C. The NAT configuration acts only on packets permitted by a referenced ACL. As a result, the ACL can permit packets destined for the Internet, performing NAT on those packets. The ACL also denies packets going to the Enterprise, meaning that the router does not apply NAT to those packets. Q5. Router R1, a branch router, connects to the Internet using DSL. Some traffic flows through a GRE and IPsec tunnel, over the DSL connection, destined for an Enterprise network. Which of the following answers best describes the router’s logic that tells the router, for a given packet, to apply GRE encapsulation to the packet? Answer: B. As for the correct answer, the process of routing a packet out a GRE tunnel interface triggers the GRE encapsulation action. As for the incorrect answers: There is no tunnel gre acl command. There is no IPsec tunnel interface. Finally, one answer refers to logic that would describe a router’s logic when determining whether to encapsulate a packet into an IPsec tunnel.